UPDATE: OCTOBER 1, 2018. 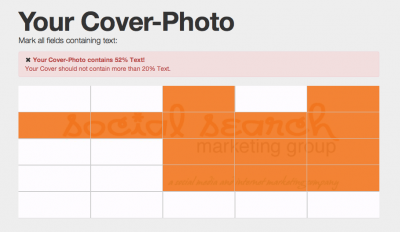 The 20% maximum texts limit for a business Facebook cover has been removed by Facebook. You can put as much text as you want now but you still need to be careful if you are going to run an ad on a creative that has a lot of texts. It could get flagged. And your Facebook ad won’t be approved. 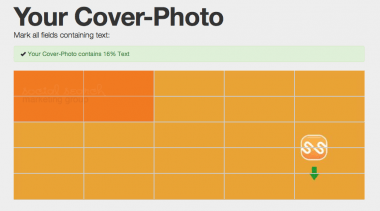 Facebook loosened up their cover photo text content rule; however, it must never exceed 20%. This revision took effect early last week and many businesses are scrambling to change their Facebook page cover photo to make it compliant to Facebook’s policy. How would you ensure that your Facebook page cover photo is within Facebook’s 20% limit? There are options to make sure that it is. Use a Photo Editing Software to create the cover page, like Photoshop. How? By using the grids and computing 20% off the Facebook page cover photo area. The advantage of this is you own the file and can edit it when you want. The question is: do you have the skill, or time? If not, then perhaps options #2 will #3 will work for you..
Outsource the Facebook Cover Photo job to a Graphic Artist. For many small businesses time is a scarce resource so hiring a graphic artist may probably be a better option. The advantage of hiring a graphic artist is that they know what they are doing when it comes to creating high quality images. But not all graphic artists know this rule (I know, because I hired one for my Facebook cover photo page when I first launched it) so make sure that you tell your graphic artist this rule. You may or may not own the edit-able version of the image file however but that will depend on your arrangement with the graphic artist. Lastly, use the 20 Percent Tool. This is a nifty tool created by Paavo Schmid. The 20 Percent Tool works for anyone who does not have the time to learn a photo editing software nor the money to pay a graphic designer. That’s the same tool that you see that is being used by some social media folks. Paavo’s tool is very straightforward. You only need to copy and paste the URL of your Facebook page. Then follow the on-screen instructions. Our original cover photo when put to the test looked like this: Yikes! Yup clearly it was in violation of the Facebook cover photo text policy, and we prefer to be on Facebook’s (or any social media platforms’) good side. With the handy 20 Percent Tool, our Facebook cover photo page does look like what it is now, whew! Upload an sRGB JPG file for faster upload. Is your Facebook cover photo compliant? Does it really matter? Your turn!